Replacing driveways, walkways, and patios with Brick Pavers is one of the most popular home improvement projects. The many shapes, styles and colors gives your home a custom appearance. But rain, oil spills, dirt and mold can penetrate deep into its porous material making it difficult to clean. And weeds and grass can be cumbersome when they keep growing in the sanded joints between the pavers. That’s why many homeowners are using Brick Paver Sealing to protect their surfaces and maintain its original luster and appearance. 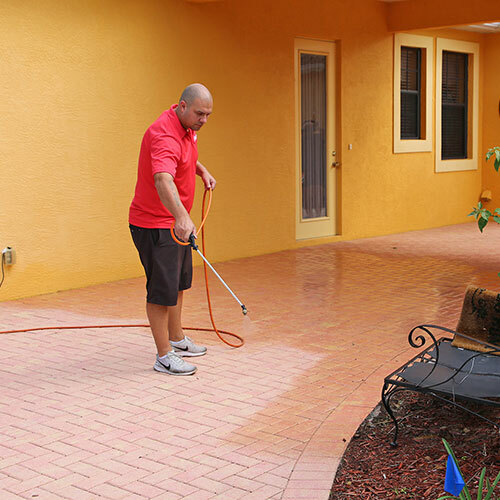 Our trained Brick Paver Sealing technicians are certified to clean and protect your surfaces in Ellenton FL! Restricts Growth of Weeds & Grass – Without sealing protection unwanted grass and weeds can grow in the sand joints. This can destabilize the pavers and lead to repairs. Saves Repair Costs – Brick Paver Sealing protects the sand joints and bricks from erosion, stains and discoloration minimizing the need for repairs down the road. UV Protection – Sealing pavers protects it from the sun’s damaging Ultra-Violet rays to prevent discoloration and fading. Resists Water, Mold and Pests – Our water-based formula waterproofs your brick pavers and resists mold and pests while protecting the sanded joints from erosion. Long-Lasting Protection – Our Brick Paver Sealing solution features Seal ‘N Lock protection that will provide a long-lasting shine and superior performance for up to 3 years. Dirt and spills rinse away with water without damaging the paver surface. High pressure cleaning is part of our Brick Paver Sealing service. Once we clear away the weeds and grass that have grown between the bricks, we thoroughly clean the entire surface. 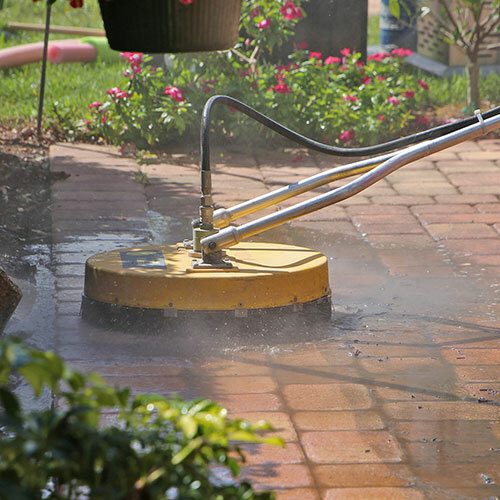 Our specialized mild detergent formula is pumped through our system at 8 gallons of water per minute at 3500 psi to clean away dirt and oil that may be adhering to the pavers. Once the pavers are completely clean, a certified technician applies our custom water-based sealant with Seal ‘N Lock protection. This non-acrylic sealer preserves the integrity of the brick pavers and gives it our signature polished (“wet look”) appearance that homeowners desire. One of the big benefits of Brick Paver Sealing is that it prevents damages from water, mold and fungus. Humid conditions make mold a common occurrence in our sub-tropical climate. The porous brick material absorbs water and becomes soft causing it to chip and crack. And the occasional heavy rain is enough to erode the sanded joints. This can further deteriorate the pavers and even cause them to loosen. You may even have noticed some loose pavers on the walkways or on your driveway. Sealing the pavers keeps them in place and provides protection from the damaging effects of rain, mold and fungus growth. Our Red Hot Services professionals are trained and certified in our Brick Paver Sealing with Seal ‘N Lock protection. This assures every homeowner in Ellenton an exceptional level of quality service and performance. We provide sealing for brick, travertine and concrete surfaces. Our sealing process is great for protecting pool surfaces as well as driveways, walkways, and patios. Keeping your brick pavers clean and maintaining your beautiful curb appeal has never been easier. 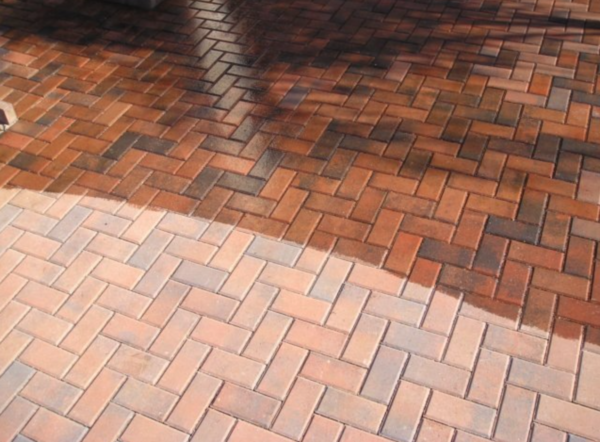 Our Brick Paver Sealing dries in just a few hours with a lustrous sheen that is easy to clean. All that is necessary is to periodically rinse the surface with water and the dirt, grime and grease will slide away without sticking to the surface. And this level of durability and protection will last for up to 3 years. Our certified technician arrives in the morning and your paver surface will be dry and ready for use that same evening. Our quick drying formula is water based and contains no acrylics. So, it’s ready in just a few hours, not days. There is no need to park your cars in the street or having to stay off the pavers for several days. Plus, its eco-friendly and safe around pets and plants. We offer a 3-year maintenance program. The Red Hot Services Brick Paver Sealing maintenance program reseals your pavers every 3 years to maintain it signature “wet look” and durable performance. This will ensure your pavers remain waterproof, prevent fading and discoloration, restrict weed and mold growth and maintain stability of the sanded joints. This guarantees long-lasting protection and extends the life of your brick pavers. 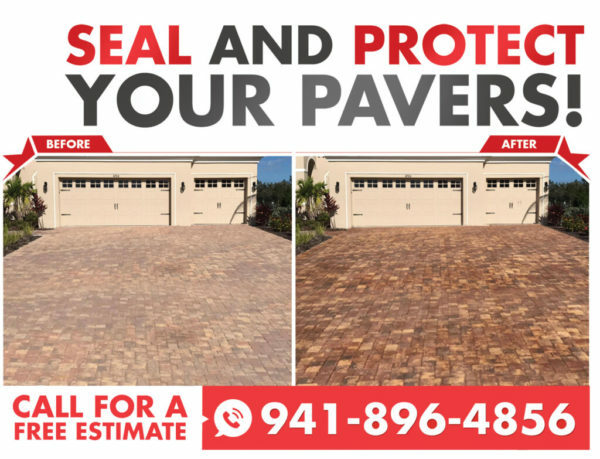 Red Hot Services is your certified Seal ‘N Lock Brick Paver Sealing provider serving Lakewood Ranch, Siesta Key, Venice FL, Longboat Key, Bradenton and communities throughout Manatee and Sarasota counties.